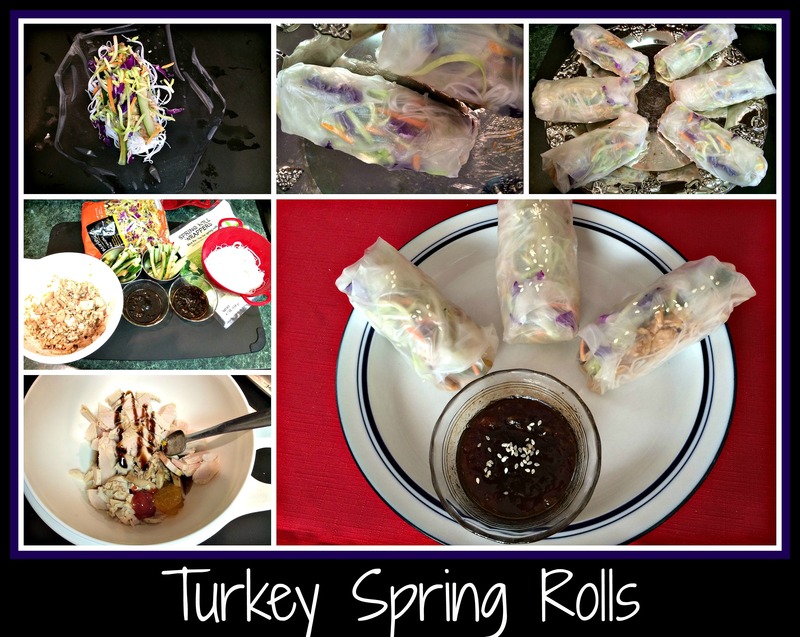 I was searching for a new way to use up leftover turkey when I stumbled upon The Pioneer Woman, showing her spring roll recipe and I knew I had my inspiration. I started by letting a small round of rice vermicelli sit in hot water until they were soft (this is, by far, the easiest thing to do!). I then created a turkey mixture using thin sliced turkey, a spoon of apricot jam, some rose’ wine (white wine would be just as good, but I had leftover rose’ from Thanksgiving and I think it goes beautifully with turkey), a dash of sesame oil, a blob of ketchup, a little commercial orange sauce, salt & pepper, and a drizzle of balsamic glaze. I set this aside and then sliced some cucumber into thin sticks for crunch and opened a bag of broccoli slaw. I was now ready to assemble these delicious spring rolls. First thing was to pull out a few rice spring roll wrappers. These things are great…. just soak them in hot water until they are limp and you can wrap them around anything. They are a little tricky when you first start playing with them, so be ready to have an extra or two on hand, just in case. Once all six rolls were done, I made a dipping sauce out of a mixture of apricot jam, balsamic vinegar, sesame oil, and a drizzle of honey. Calling this a “dipping sauce” is sort of a mis-nomer… it was more like a “spooning sauce”, but you get the idea. I could have made it runnier by warming the jam up a bit, but this was so yummy that I left it alone. I liked the thick texture of the sauce when spooned onto (or into, after a bite) the spring roll, so it was all good. I also sprinkled a tiny bit of sesame seeds over top to make it look pretty, but that was totally unnecessary. These things were gorgeous in their own right. Try this recipe sometime… you’ll be amazed, just as I was, at the fresh twist you get from using turkey in such a unique way. This entry was posted in cooking with wine, easy recipe, leftover recipe, leftovers, lunch recipe, rose wine, white wine and tagged broccoli slaw, cucumber, easy lunch, easy recipe, rose' wine, spring rolls, turkey, white wine.